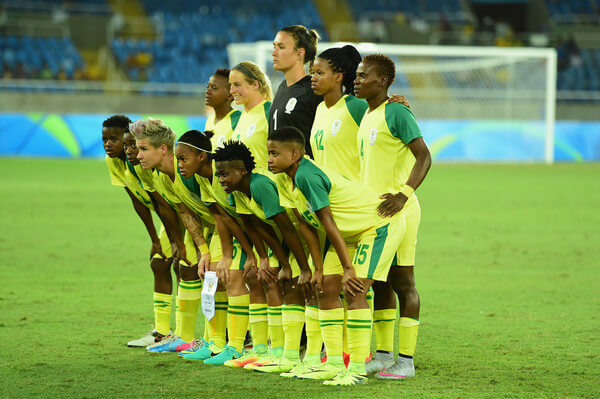 South Africa line up prior to to the Women's Group E first round match between South Africa and China PR on Day 1 of the Rio 2016 Olympic Games at the Olympic Stadium on August 6, 2016 in Rio de Janeiro, Brazil. Banyana players continue to move abroad as women's football in the country appears to be heading in the right direction. Just when one thought the South African women’s team has done well for themselves after their recent exploits in the 2018 Women’s AFCON tourney, more and more good news keep coming in for the National team players. Banyana Banyana striker Ode Fulutudilu has pulled off a great surprise and went on to sign for Spanish side Malaga, becoming the first ever South African woman to play in Spain. The little known 28-year-old forward joins Malaga from Finnish side Naisten Liiga where she had a season high of 15 goals from 23 matches, showing her prowess in front of goal. Her good run in Finland eventually caught the attention of coach Desiree Ellis and earned her a call up to the Banyana Banyana setup for an international friendly against Chile. Fulutudilu’s origins can be traced back to DR Congo where she was born before moving to South Africa. While in Mzansi, she went on to play in the Sasol Women’s League where she shone so much that she attracted interest from overseas clubs and eventually settled at Finnish club Oulu Nice. Unfortunately, Fulutudilu missed out on a place in the Banyana Banyana team that impressively went all the way to the finals of the recent 2018 Women’s AFCON tournament. However, Fulutudilu will be hoping to do well in order to be considered by coach Desiree Ellis for the Women’s FIFA world cup taking place in France later this year. Speaking on her move to Malaga, Ode said "I am so extremely excited about this next chapter. I hope to fly the South African flag high and take it to places that have never seen our talent before". That said, eyes will be on Ode to impress at her new club and lift the South African flag high. She will also be eyeing a place in South Africa's squad for June's World Cup in France. Auba has been clutch, but can his goals bring CL football back to the Emirates?